The gospel which orders our understanding on this day is the parable of the sower and the seed. It focuses our thoughts on the quality of the ground upon which the Word of God is sown. The cultivation of the ground, however, immediately recalls us to the story of the Fall in this morning’s first lesson. The ground is cursed. Adam, who signifies our humanity collectively and individually speaking, is told “cursed is the ground because of you, in toil you shall eat of it all the days of your life.” The ground is cursed because Adam and Eve succumbed to the beguiling wisdom of the serpent and thus lost the ground of their standing with God (pun intended). The ground of creation becomes the place of our alienation from God. In a delightful image, the Lord God is said to have “walked in the garden in the cool of the day”, but where were we? We had hidden ourselves from his presence in the fearful beginnings of an awareness of our self-willed separation from him. It is important to understand something of what this means. The story of the Fall seeks to explain the origin of sin and evil, of suffering and death. It locates the problem not in the material universe but in the disobedience of our humanity. As disobedience, it is an act of the will against what is known as good. Creation as a whole and in its individual parts is emphatically and unambiguously declared to be “good”; in fact, “very good.” The commandment given to us – it is only to humans that a commandment can be given – is also by definition good. It is implicitly known as good. O LORD God, who seest that we put not our trust in any thing that we do: Mercifully grant that by thy power we may be defended against all adversity; through Jesus Christ our Lord. Amen. 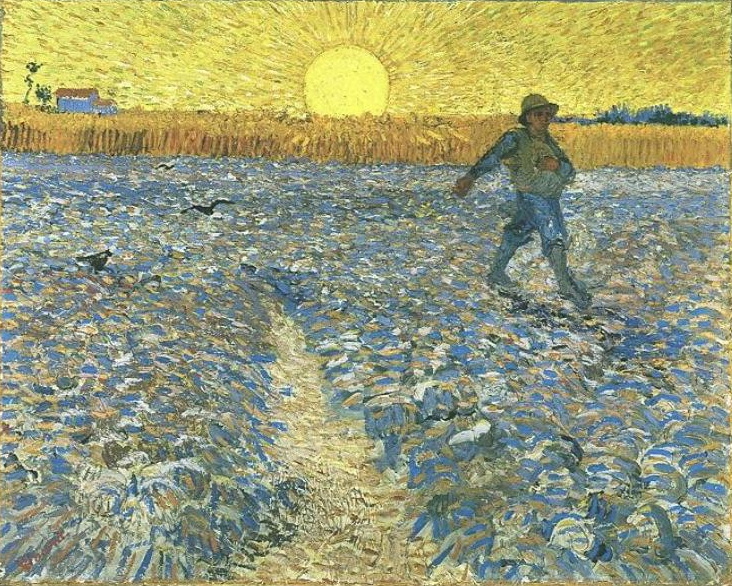 Artwork: Vincent van Gogh, The Sower, 1888. Oil on canvas, Kröller-Müller Museum, Otterlo. Read more about Saint Matthias here. Artwork: Georg Pämer, Saint Matthias, 1696. Polychrome wood statue, Pfarrkirche Mariä Himmelfahrt (Parish Church of the Assumption of the Virgin Mary), Grassau, Chiemgau, Bavaria. Almighty God, we offer thanks for the faith and witness of Paul Sasaki, bishop in the Nippon Sei Ko Kai, tortured and imprisoned by his government, and Philip [Lindel] Tsen, leader of the Chinese Anglican Church, arrested for his faith. We pray that all Church leaders oppressed by hostile governments may be delivered by thy mercy, and that by the power of the Holy Spirit we may be faithful to the Gospel of our Savior Jesus Christ; who livest and reignest with thee and the Holy Spirit, one God, for ever and ever. Amen. The kingdom of heaven is imaged as God’s vineyard – not the Ste. Famille vineyard, not the vineyards of Grand Pré, not your vineyard, not my vineyard but God’s vineyard. It is a nice thought, especially in the bleak, mid-winter, to think of the world, too, not as snow and ice, but as a fruitful vineyard that connects us to the kingdom of heaven. To do so means to exercise our theological imaginations. The world is the vineyard of creation. To see the world in that way is to be reminded that it is God’s world, a world which reflects God’s will and purpose for our humanity. In a way, this parable is a strong reminder of that significant spiritual truth. In a way, too, this parable recalls us to the justice of the Creator in the good order of his creation. “Is it not lawful for me to do what I will with mine own?” Now, there’s a thought. Can’t God just do whatever he likes? Whatever he wills? Such is a voluntarist conception of God which emphasizes the sovereign freedom of God at the expense of the sovereign justice of God. Yet, it is those two things that are joined together here, I think, in this Gospel story. What is being challenged is not God’s justice but our sense of human justice. What is being challenged is our propensity to measure God by our standards, by our wills and desires and expectations, if you will. The Gospel returns us to a proper relation to God and to the nature of our lives in his vineyard. In a way, it is really all about grace. Grace is the free gift of God but that free gift perfects and does not destroy the created world. Grace corrects and counters but, ultimately, does not override and deny the character of the world and the creatures within it. That is the beauty and the truth of Redemption. O LORD, we beseech thee favourably to hear the prayers of thy people; that we, who are justly punished for our offences, may be mercifully delivered by thy goodness, for the glory of thy Name; through Jesus Christ our Saviour, who liveth and reigneth with thee and the Holy Spirit, ever one God, world without end. Amen. 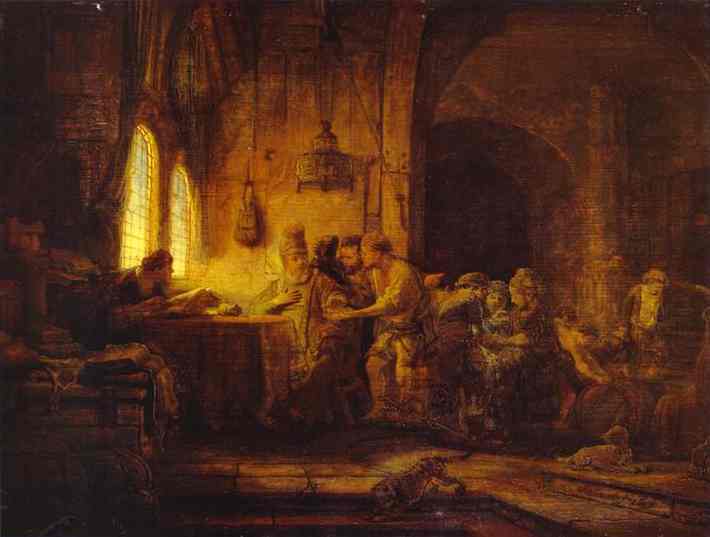 Artwork: Rembrandt, The Parable of the Labourers in the Vineyard, 1637. Oil on panel, State Hermitage Museum, St. Petersburg. O GOD, who didst bestow upon thy Saints such marvellous virtue, that they were able to stand fast, and have the victory against the world, the flesh, and the devil: Grant that we, who now commemorate thy Martyr Valentine, may ever rejoice in their fellowship, and also be enabled by thy grace to fight the good fight of faith and lay hold upon eternal life; through our Lord Jesus Christ, who with thee and the Holy Spirit liveth and reigneth, one God, for ever and ever. Amen. 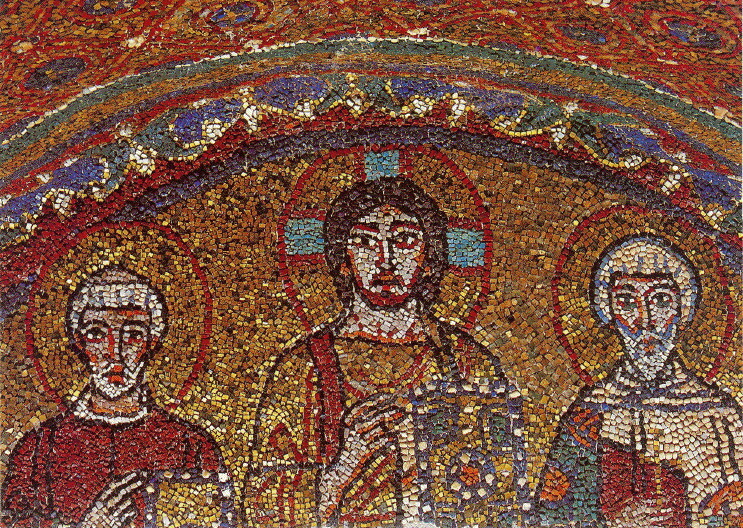 Artwork: Christ with Saint Valentine (left) and Saint Zeno (right), 9th-century mosaic, Chapel of San Zeno, Basilica of Saint Praxades, Rome. In a way, it is a concise summary of natural, moral, political and metaphysical philosophy. But he immediately goes on to say that “there are two vast, spacious things” that are more necessary to measure or know and, “yet few there are,” he says “that sound them,” echoing, I think, the insight of the great medieval theologian, Thomas Aquinas, about the need for another science, a divine science. Even as regards those truths about God which human reason could have discovered, it was necessary that man should be taught by a divine revelation; because the truth about God such as reason could discover, would only be known by a few, and that after a long time, and with the admixture of many errors.